I happened upon this quote this morning and shared it immediately. I love the idea of being “recklessly” optimistic. Of course, we should! Why not? It’s probably in our nature as human beings to take something a little too far…why not make it optimism? Happy Saturday, darlings! Here’s what intrigued me this week, aka, my weekend musings. Ah, the power of the people. Amongst a movement called #MuteRKelly and a docuseries by Lifetime — yes, Lifetime — Television, called “Surviving R. Kelly,” record label RCA has reportedly dropped R. Kelly. While RCA parent company Sony Music has not officially commented, R. Kelly no longer appears on the label’s website under artists. The docuseries, “Surviving R. Kelly,” details more than 25 years of accusations of sexual violence and abuse against the R&B singer. R. Kelly has been accused of sexual relationships with minors going back to 1994. The docuseries is fascinating and sheds light on what appears to be more than two decades of (reported) sexual abuse against young women for which R. Kelly has not been held accountable. This is a POWERFUL reminder of how our voices can make a difference. Kudos to the many dedicated women, parents, and human beings who kept shedding light on that which was done in the dark. Together, we can move mountains! All images above via Departures Magazine. You’ll need a helicopter, a hefty budget, and a trip to Alaska to spot the aurora borealis from this gorgeous lodge, featured in Departures Magazine. Sheldon Chalet is a new lodge that sits right on Denali’s shoulder in Alaska, accessible only by helicopter. Overnight accommodations will run you $2,300 per person, per night, but the Northern Lights — should they decide to appear during your stay — are priceless. Have you seen the Northern Lights? Is it on your bucket list? Do you have MOXIE!? I know you do, as do I! So, it’s not surprising that your favorite story of the week on HoneyGood.com was all about MOXIE! And, many of you loved the journal featured in my story. Good news, you can purchase it here. In case you missed it, let me share a bit about my musings on MOXIE! Every one of you who reads my musings has her MOXIE! You are a part of my brand, darlings. That is what makes my brand unique and perfect. My brand is about US, not ME. We’ve got MOXIE!, darlings, and don’t you ever forget it. We are daring, courageous and have determination. Are you retiring soon? Get financially ready, now! Although Shelly is already semi-retired, I have many friends headed toward retirement, many of whom would be well-served by this article, via Money Magazine, about getting ready for retirement when it’s one year away. According to Money, it’s ideal to start charting your retirement plan ten years in advance and, hopefully, you’ve already done that! But, for those of you who are less than 12 months from retiring, here are some key (financial) moves to set you up for retirement success. I’ll be LIVE on Facebook this Wednesday, January 23 at 10:30 am. 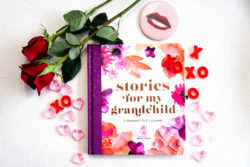 With the release of Stories for my Grandchild just weeks away, it’s a perfect time to talk about the most exciting — and memorable — occurrences in my life, and yours, and what lessons and values we want to share with our Grands. As many of you know, Stories for my Grandchild, a treasured keepsake story, from a grandmother to her grandchild. Please join me for this LIVE event. What interested you this week? Please share your thoughts with me via Twitter, Facebook, Pinterest, Instagram or in the comments section below.